This year I’m keeping a photographic diary of my humble vegetable garden; what’s growing when, where and how well. Yes, I know it’s August and I’m writing about July June, but with recent trips to the UK and France I am way, WAY behind on my blogging activities. I took all the photographs, so at least I could backtrack and post at a later date. 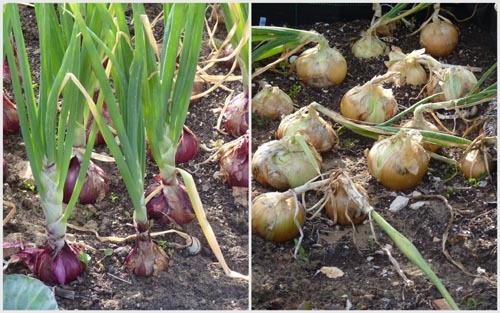 The white onions planted on the 19/11/2012 are now ready for harvest while the red onions planted in January are not that far behind. The rhubarb is doing reasonably well. Not brilliant but it’s still clinging to life. Unfortunately, some white fluffy bugs, which I believe are the dreaded mealy bugs have taken up residence. The only thing I’ve found to kill these annoying little critters is diluted hydrogen peroxide 3% volume. However, I do not want to apply this concoction to something I plan to eat! The groselhos bush I purchased last year at Lidls continues to thrive but as yet has not yielded any fruit. I think it’s a cross between a gooseberry and a raspberry. We will see. 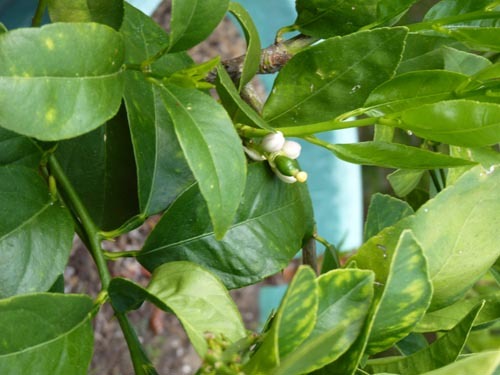 Can you name these fruit bushes? The following are stem cuttings I took last year from my daughter’s garden. 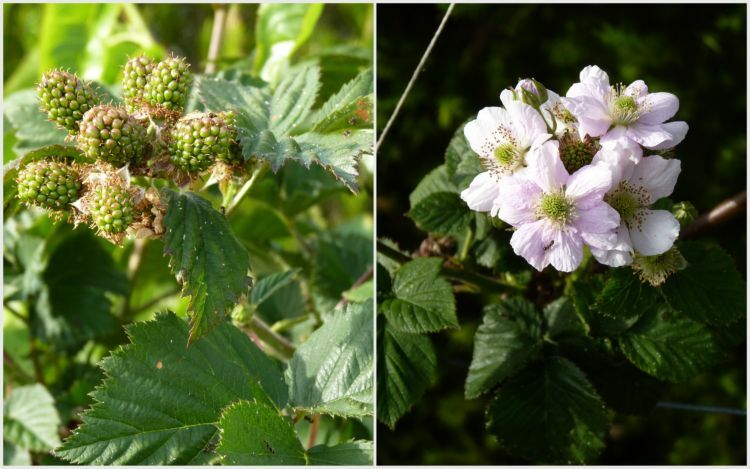 One is a raspberry the other two are either blackcurrant, or blueberry. Yay! I finally have two tiny limes. Despite removing all the leaves affected with the citrus vine weevil it has returned. Nothing seems to deter these tenacious little critters! 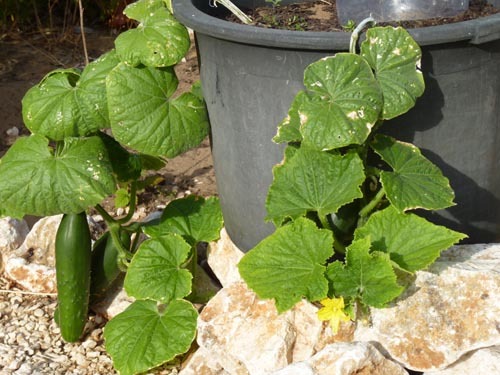 The cucumber plugs planted in March have a couple of healthy cucumbers ready for harvesting with more on the way. 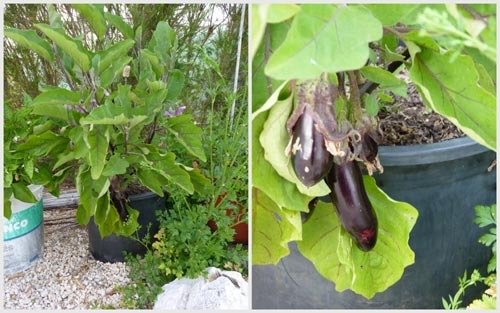 In February I bought two aubergine (beringela) plugs. 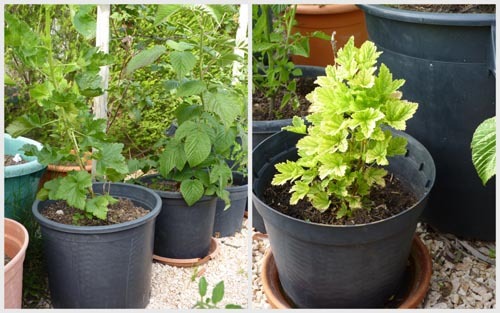 One I planted in the raised vegetable bed and the other in the pot pictured below. Only the plant in the pot survived and it is now bearing fruit! 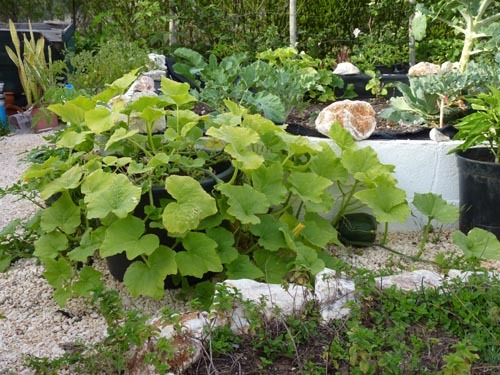 The myestery plants courtesy of God, or the birds proved to be squash plants. 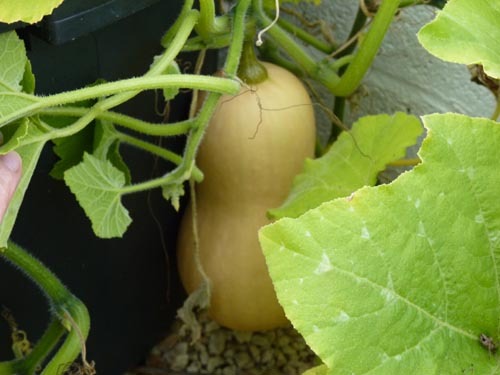 There seems to be two varieties – well put it this way, the squash are two different shapes. I’ve never been successful growing squash in previous years so I’m naturally delighted by the gift. This variety must be Piglet proof, so I better remember to save some seed for next year! What else am I growing? 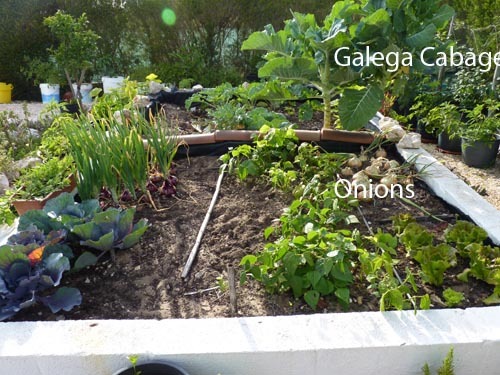 Galega Cabbage: Thes cabbages are now over 1m (3′) tall. These are brilliant if you are limited for space. You remove the individual leaves as you need them and you are eventually left with what I can only describe as a cabbage tree! Tomatoes: masses of cherry tomatoes. I was given other varieties but they did not survive or grew too leggy to grow in pots. Fig tree: all the leaves turned yellow and then fell before turning brown. I was told it was either too much water or not enough. Don’t you just love that tidbit of advice? My cabbages are plagued with cabbage white butterflies and then hundreds of squishy green caterpillars. I spray the cabbages with a weak solution of washing-up liquid and water, although over time I’ve manned up and now squish the caterpillars with my bare fingers. Ants! We have five different types of ant. We’ve tried most branded treatments but none seem to work. I was once given a recipe for a homemade concoction which included a powder called borax. Unfortunately, after spending ages sourcing the borax I lost the recipe. Tis true didi 🙂 IT certainly tastes different to the fruit and veg that has been shipped in from China and Brazil! Your harvest shot looks great . . . and that’s a nice looking butternut squash. Butternut squash is my favorite winter squash. Roasted and mashed with butter, salt, and pepper. YUMMY! Thanks Nancy, we have since eaten one of the butternut squash and it was delicious. How lovely! What a wonderful variety of produce! Our garden turned into a jungle over the past 5 days when we were out of town. I need to got out there and tame it. You only need to be away a few days and the weeds and the bugs take over. Hi Kim, that’s strange. You should be having tomatoes by now. Did you buy cherry tomatoes? 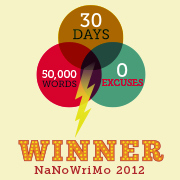 Despite all your ups and downs, your plot seems to be flourishing, and that is something to be proud of. 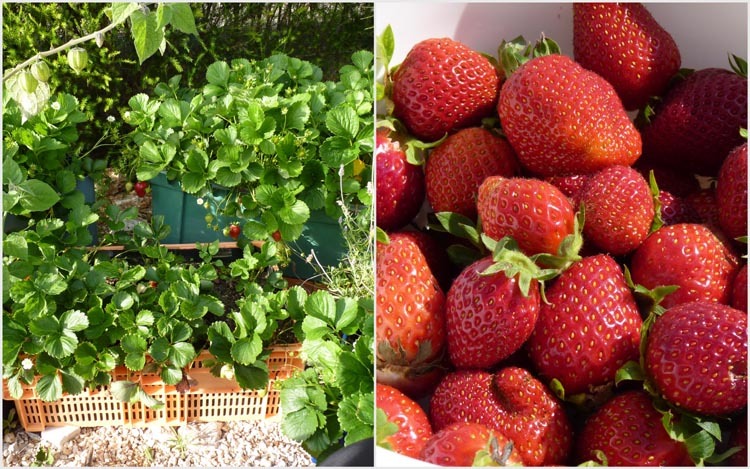 It’s hard work, but worth it to taste home-grown veg and fruit straight from your own backyard. Well done! Thanks Barb. I also a big thank you to my friends who have looked after my veggies while I was away. And I’ve been travelling alot this year, so far. What’s a tayberry? 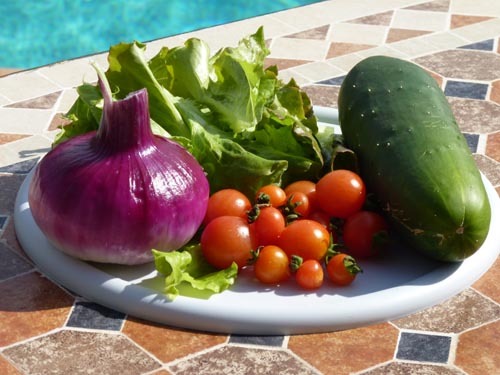 The veggies look great and there’s no problem ingesting a tiny bit of hydrogen peroxide–it’s used as an oral debriding agent. Rinse off your veggies first and you should be fine. what a rich harvest. There’s so much work and so much joy in growing your own food. those white cabbage moths were the bane of my existence a few years ago. i read that if you can make and put up some pretend white moths they will leave the cabbages alone. Didn’t try it yet so can’t say for sure. 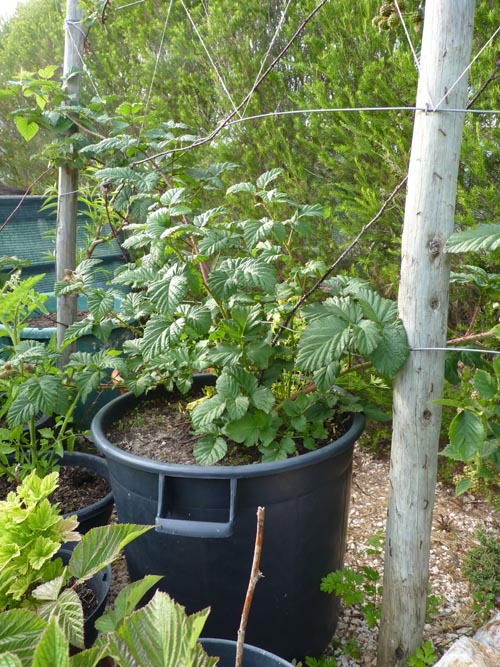 Awesome harvest – we’ve had so much rain here in the U.S. South this summer, our garden is a wash. How tough are lime trees to grow? I’d love to have one. I don’t know if you can get them where you are, but a pile of grits on an ant pile will take care of that problem! 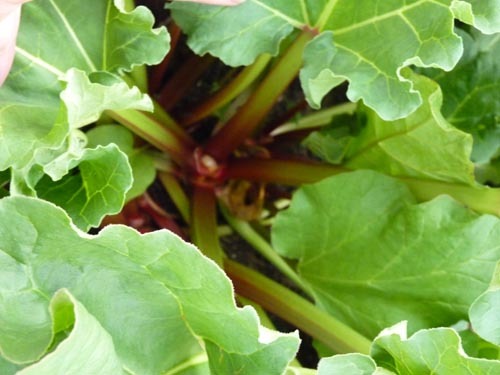 Just had a thought about the cabbage butterfly and caterpillars – soak rhubarb leaves in water for a few weeks then spray the plants likely to be affected by the beasties with the “brew”. This will discourage them. Hi Clara, what a great idea! I wonder when the cabbage white butterflies die off? I love your garden. I live in the far Northern tropics of Queensland, Australia. It is the first day of Spring here and I have a thriving young garden now. I probably should have planted earlier in our Winter, as our temps rarely drop below 15C. Wow. I think the mystery fruit on the left of the screen is currant – black or red. We have red currant bushes at our farm in Virginia. Your garden is lovely. I’m totally impressed with what you can do in pots. I may try this next year. I’m running behind with my gardening posts as you probably realise. It will be interesting to see if the mystery plant fruits next year. 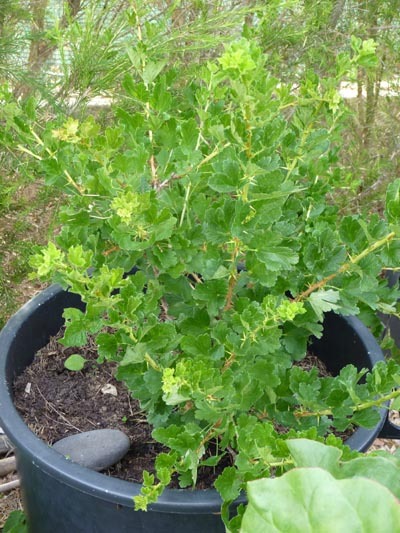 FYI: Groselha is redcurrant in English, Ribes Rubrum species. 🙂 Happy gardening!